MemSQL is a type of in-memory database that can serve faster reads and writes than a traditional database. Even though it is a new technology, it speaks the MySQL protocol, so it feels very familiar to work with. MemSQL has embraced the newest capabilities of MySQL with modern features, like JSON support and the ability to upsert data. One of the greatest advantages of MemSQL over MySQL is its ability to split a single query across multiple nodes, known as massively parallel processing, which results in much faster read queries. In this tutorial, we will install MemSQL on a single Ubuntu 14.04 server, run performance benchmarks, and play with inserting JSON data through a command line MySQL client. In this section, we will prepare our working environment for the MemSQL installation. The latest version of MemSQL is listed on their download page. We'll be downloading and installing MemSQL Ops, which is a program that manages downloading and preparing your server for correctly running MemSQL. The most recent version of MemSQL Ops at the time of writing is 4.0.35. First, download MemSQL's installation package file from their website. Extracting the package has created a folder called memsql-ops-4.0.35. Note that the folder name has the version number, so if you download a newer version than what this tutorial specifies, you will have a folder with the version you downloaded. Change directories into this folder. Then, run the installation script, which is part of the installation package we just extracted. You will see some output from the script. After a moment, it will ask you if you'd like to install MemSQL on this host only. We'll look at installing MemSQL across multiple machines in a future tutorial. So, for the purposes of this tutorial, let's say yes by entering y. 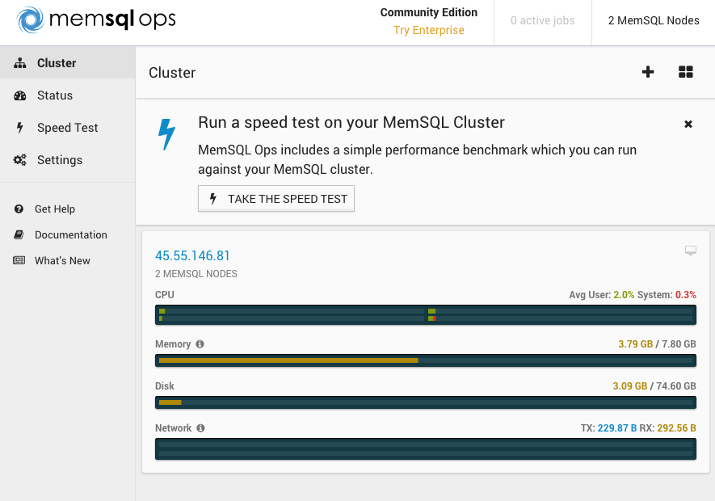 Now you have a MemSQL cluster deployed to your Ubuntu server! However, from the logs above, you'll notice that MemSQL was installed twice. MemSQL can run as two different roles: an aggregator node and a leaf node. The reason why MemSQL was installed twice is because it needs at least one aggregator node and at least one leaf node for a cluster to operate. The aggregator node is your interface to MemSQL. To the outside world, it looks a lot like MySQL: it listens on the same port, and you can connect tools that expect to talk to MySQL and standard MySQL libraries to it. The aggregator's job is to know about all of the MemSQL leaf nodes, handle MySQL clients, and translate their queries to MemSQL. When you have multiple leaf nodes, the aggregator is responsible for translating MySQL queries to all the leaf nodes that should be involved in that query. It then takes the responses from all the leaf nodes and aggregates the result into one query that returns to your MySQL client. This is how parallel queries are managed. Our single-host setup has the aggregator and leaf node running on the same machine, but you can add many more leaf nodes across many other machines. Let's see how quickly MemSQL can operate by using the MemSQL Ops tool, which was installed as part of MemSQL's installation script. 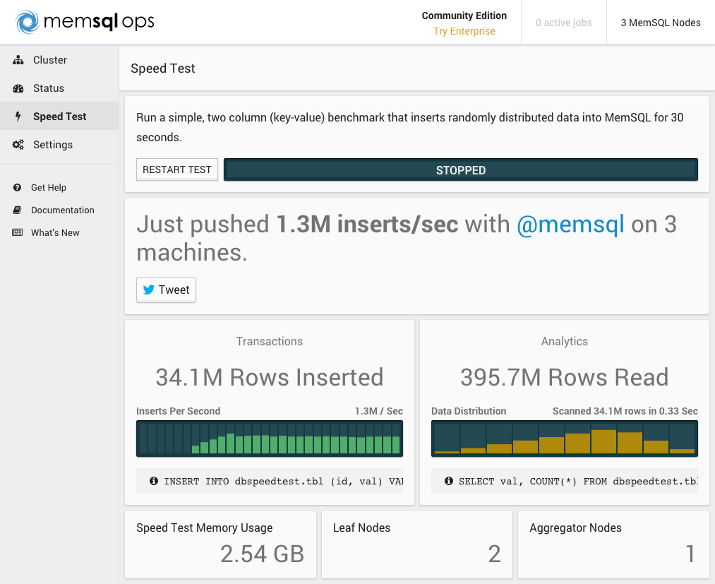 The MemSQL Ops tool gives you an overview of your cluster. We have 2 MemSQL nodes: the master aggregator and the leaf node. By doubling the number of leaf nodes, we were able to almost double our insert rate. By looking at the Rows Read sections, we can see that our three-node cluster was able to simultaneously read 12M more rows than the single-node cluster in the same amount of time. To clients, MemSQL looks like MySQL; they both speak the same protocol. To start talking to our MemSQL cluster, let's install a mysql-client. First, update apt so that we install the latest client in the next step. Now, install a MySQL client. This will give us a mysql command to execute. We're now ready to connect to MemSQL using a MySQL client. We're going to connect as the root user to the host 127.0.0.1 (which is our localhost IP address) on port 3306. We'll also customize the prompt message to memsql>. mysql -u root -h 127.0.0.1 -P 3306 --prompt="memsql> "
You'll see a few lines of output followed by the memsql> prompt. Create a new database called tutorial. Then switch to using the new database with the use command. Next, we'll create a users table which will have the id an an email fields. We have to specify a type for these two fields. Let's make id a bigint and email a varchar with a length of 255. We'll also tell the database that the id field is a primary key and the email field can't be null. You may notice poor execution time on that last command (15 - 20 seconds). There is one main reason why MemSQL is slow to create this new table: code generation. Under the hood, MemSQL uses code generation to execute queries. This means that any time a new type of query is encountered, MemSQL needs to generate and compile code that represents the query. This code is then shipped to the cluster for execution. This speeds up processing the actual data, but there is a cost to preparation. MemSQL does what it can to re-use pre-generated queries, but new queries whose structure has never yet been seen will have a slowdown. Back to our users table, take a look at the table definition. Now, let's insert some example emails into the users table. This syntax is the same that we might use for a MySQL database. Now query the users table. MemSQL provides a JSON type, so in this step, we'll create an events table to make use of incoming events. This table will have an id field (like we did for users) and an event field, which will be a JSON type. Let's insert a couple of events. Within the JSON, we'll reference an email field that, in turn, references back to the IDs of the users we inserted in step 3. Now we can take a look at the events we just inserted. Next, we can query all the events whose JSON name property is the text "received email". Try changing that query to finding those whose name property is the text "sent email". This latest query ran much much faster than the previous one. This is because we only changed a parameter in the query, so MemSQL was able to skip the code generation. Let's do something advanced for a distributed SQL database: let's join two tables on non-primary keys where one value of the join is nested within a JSON value but filters on a different JSON value. First, we'll ask for all fields of the user table with the events table joined on by matching email where the event name is "received email". Next, try that same query, but filter to only "sent email" events. Like before, the second query was much faster than the first. The benefits of code generation pay off when executing over millions of rows, as we saw in the benchmark. The flexibility to use a scale-out SQL database that understands JSON and how to arbitrarily join across tables is a powerful user feature. You've installed MemSQL, run a benchmark of your node's performance, interacted with your node via a standard MySQL client, and played with some advanced features not found in MySQL. This should be a good taste of what an in-memory SQL database can do for you. There's still plenty left to learn about how MemSQL actually distributes your data, how to structure tables for maximum performance, how to expand MemSQL across multiple nodes, how to replicate your data for high availability, and how to secure MemSQL.